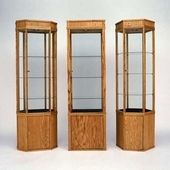 Hardwood made in USA oak retail display case showcases, jewelry cases, wall cases, tower, wooden trophy case, and cabinet cases, for displaying all of your merchandise in an elegant fashion. All cases come standard with locks and black velvet pads on bottom shelf. 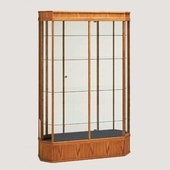 *All prices are based on Red Oak with a Watco Danish oil finish. We can also make these out of your choice of wood (cherry, walnut, maple, etc.) by quote.